Want to take on an island adventure? Or maybe you’re required to immediately fly off across town. Either way, you can rely on the BN-2T Turbine Islander to take you there. This light weight and small prop aircraft is also great for sightseeing. Bring 8 of your friends along and you’ll get to enjoy an awesome flight in the next few hours or several minutes on this plane. This is a favorite among those who’d like to see more terrains and rugged landscapes. It can even land even on short strips, hence it has a lot of uses such as rescue operations or for agricultural businesses. Since its introduction in the 1960s, the Britten Norman Islander series has had over 1,200 units produced and flown all over the world. At most, this aircraft can fly 10 people and if you’re coming from Ontario, Canada you can reach up to Oklahoma, United States via this plane. 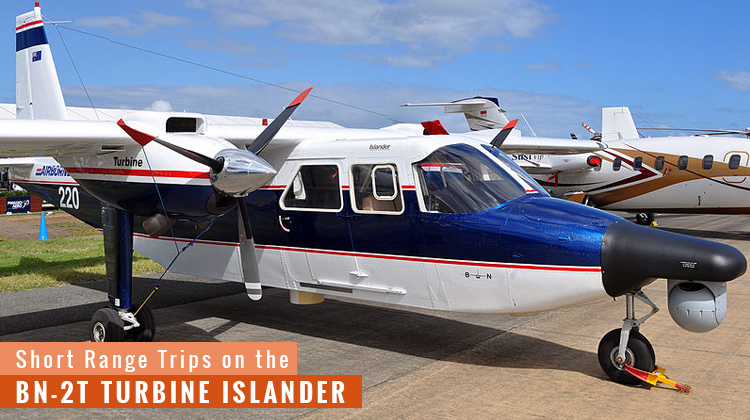 Know more about the specifications of the BN-2T Turbine Islander and be sure to charter for its flight aboard today. You can take a breather while you’re rushing for an across-the-town meeting on the BN-2T Turbine Islander. This 10-seater can be customized with different types of passenger seats, depending on the operator’s preferences. As it flies from or to rough terrains, you’d be glad to experience its smooth glides. The propellers mounted on each wing can also be a delight to observe. Given its constant speed on short range flights, it’s no wonder why the BN-2T Turbine Islander would be the awesome choice for sightseers. Riding leisurely aboard this aircraft also gives you the chance to visit hinterlands and other rugged landscapes. With its small size, it can conveniently fly from or to slightly grassier runways. Rest assured, your certified, licensed and registered operator will be well-trained enough to handle aircrafts on more challenging strips. Given your intended location, it would be best for you to confirm the acceptable number of passengers and total load in your chartered aircraft. Keep in mind a lighter plane enables for farther and faster flights. Given the number of people and baggage hopping aboard the plane, your charter service can prepare better with regard the details of your flight plan. Manufactured by Britten-Norman the BN-2T Turbine Islander witnessed its first flight in 1965. This plane has two engines which has the Defender as its military variant. This plane’s beginnings can be traced from being an agricultural machinery to being eventually prospected as a hovering aircraft. A rising trend on commuter airlines was also observed hence adjustments were also made to cater for the said need. Today, a total of 1,280 BN-2T Turbine Islander units have been produced and are being flown all around the world. The Britten Norman Islander series are continuously being produced to fit the needs of its operators.